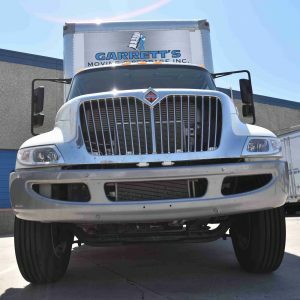 Garrett’s Movers Dallas recently purchased three new cabs and two new trailers so that we’d be able to serve more clients moving to and from Dallas and beyond! Working with Garrett’s Movers Dallas gives you the advantage of working with an independent, family-owned company, and the size and longevity for you to be assured that we’re be around after your move is completed. Garrett’s Moving & Storage was founded by Garrett Ware in 1992, and he was later joined in business by his son, Brandon. They have assembled a team of drivers, packers and movers that have substantial experience. Garrett’s Movers Dallas doesn’t employ everyone. We perform a background check on every applicant to make sure that we’re employing hard-working, trustworthy people. When they arrive at your door, rest assured that we’d trust them to move our family, too. One thing you’ll notice is that our trucks have OUR name on them, and no one else’s name. This means that when you have a question or concern, you can contact the owner directly, and not have to pull out an ATLAS to find out where the headquarters might be, nor would you have to make a UNITED front with your family to get the attention you need. Garrett’s Movers Dallas is headquartered int he great State of Texas, but our trucks travel all over the United States. If you’re moving from Orlando or San Diego or anywhere in between, we’re ready to assist. Even if you need us to take a left-turn in Albuquerque to find your new home in New Mexico, we can bring your belongings to you. Our complimentary shrink-wrapping helps to protect your furniture. Since we do this PRIOR to leaving your current home, it greatly reduces the chances for dings and damage to occur. For maximum protection, check out our insurance options in the Help Center Menu above. Call us today and we’ll arrange for a free estimate, or click here to submit a quote request, and we’ll be sure to contact you for an appointment!